If you are a mom on the go then you will love this recipe I have for you today! 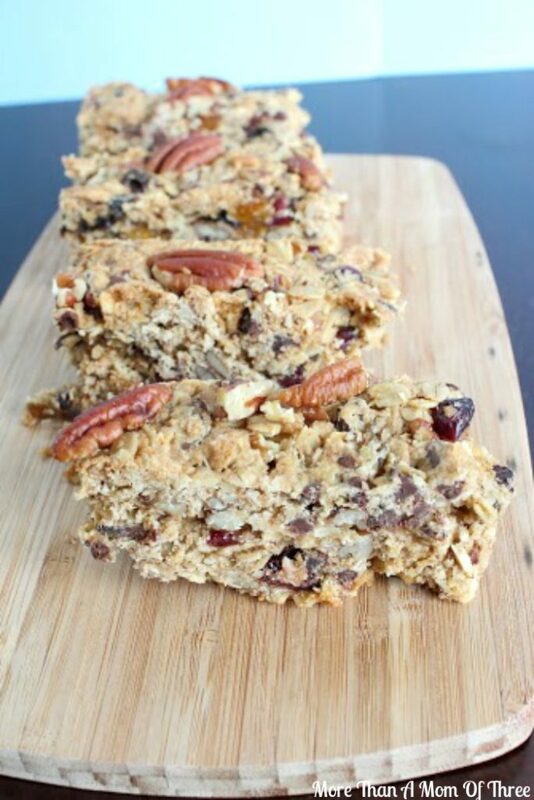 These oatmeal cookie fruit and nut bars are perfect for a quick breakfast or easy afternoon snack. If you are a mom like me breakfast can quickly be forgotten. Then I find myself starving at lunch and tend to eat more than I should at lunch, its not a good situation. 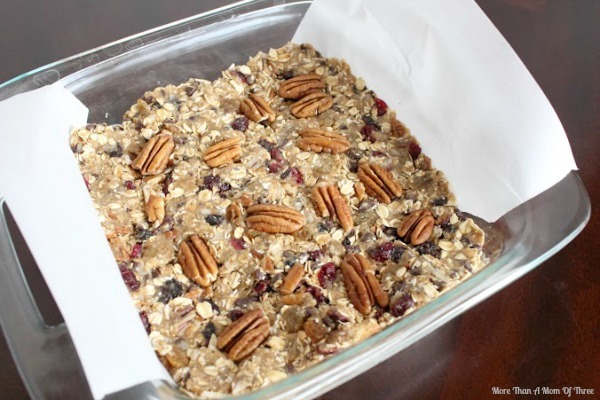 The oatmeal cookie fruit and nut bars are packed with goodness. 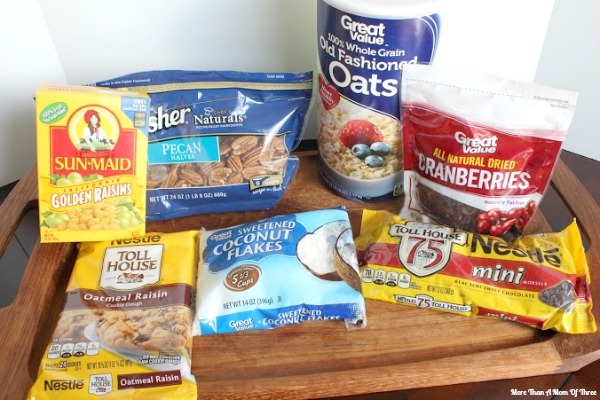 Nuts, oats, dried fruit and a small bit of chocolate helps tame that sweet tooth. 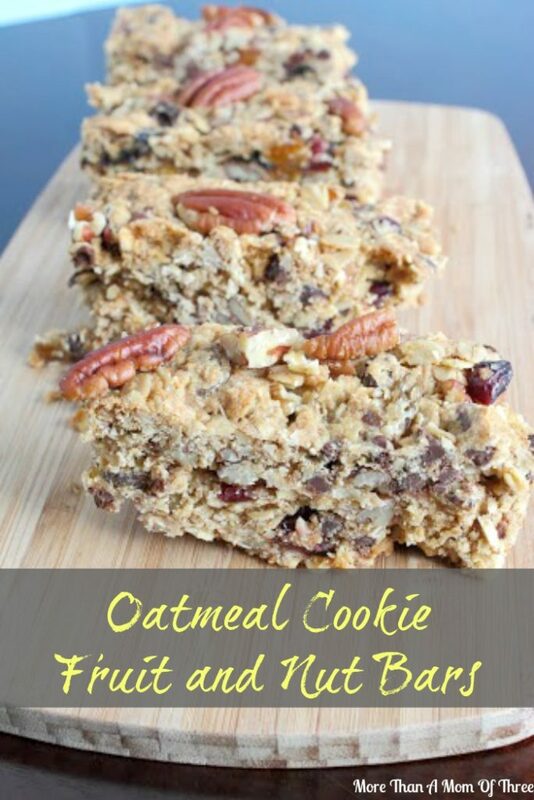 With the combination with the oats and nuts it fills me up offering a more healthy option for breakfast or late afternoon snack to keep me going to chase after the kids. They are not dry like other bars of this kind either which I love. There is nothing worse than a dry oatmeal or nut based bar to me, yuck! With very little effort to throw them together, they are by far better than most store bought bars I have had. My picky eater even loves them! He has asked for them almost every day last week for an after school snack. It’s a win win! 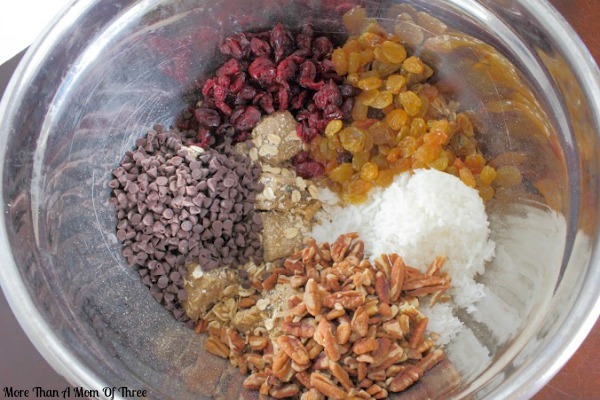 In a small bowl soak the Raisins and Cranberries in 2 cups warm water for 5 minutes, drain. 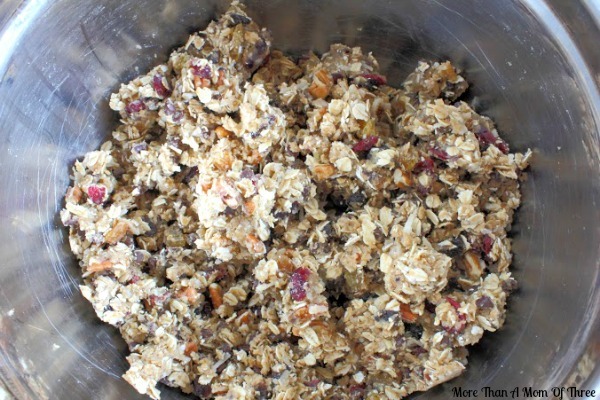 In another bowl break the Oatmeal cookies apart and add the Oats, Raisins, Cranberries, Pecans, Coconut and Chocolate chips. Mix to combine. Place the mixture into an 8×8 inch pan lined with lightly greased parchment paper with a little excess paper hanging over the edges to use as handles to remove from the pan for cutting. Optional, place whole pecans or additional chopped pecans on top. Bake at 350˚ until deep golden brown, 30-35 minutes. Store in airtight container unrefrigerated up to one week. Refrigerated up to two weeks.